Dewsbury Minster have appointed Exaudite to get the necessary quotations to get the repair work to the cracked third done. St Margaret Mary, Perry Common have appointed Exaudite to undertake the replacement of the mechanical tolling hammer with an electomagnetic hammer and electronic tolling unit. An inspection of the ring of three bells at Long Whatton has been done and recommendations made for repair and refurbishment. 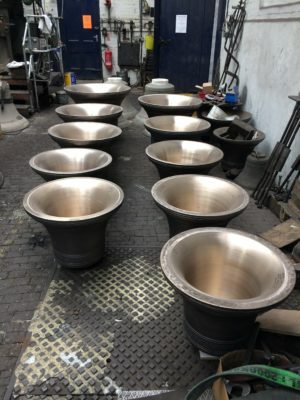 A progress check has been made with Taylors bellfoundry on the new bells for Cheltenham Minster. 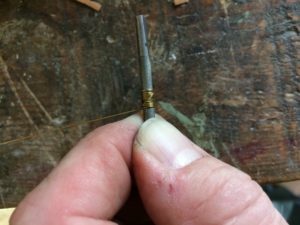 The ten smallest bells have all now been tuned and are mouth upwards in the tuning shop. Just the three largest left to tune now before they go off to Whites of Appleton for fitting. A cracked bell and a piano move. 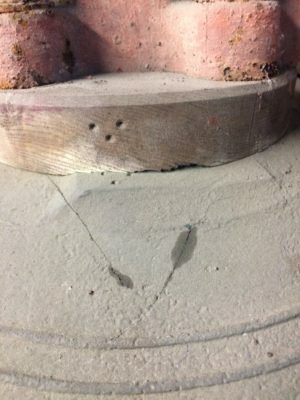 I was asked to inspect a bell with a potential crack in it at Dewsbury on Thursday. 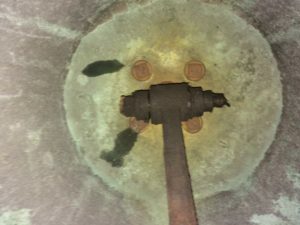 Unfortunately, when I got to look closely at it I found that there were several cracks all emanating from the bolt holes to a degree that I thought it was unsafe to continue ringing the bell. The tone had suffered too (the fundamental was non-existent). I’ve made my recommendations to the minster authorities – hopefully we can move forward quickly to get the bell welded and back in use. 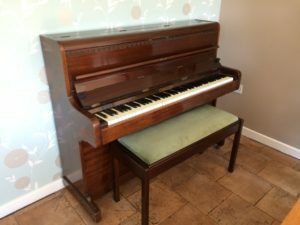 Saturday saw me moving a piano from a friend’s parents-in-law’s house in Prestbury in Cheshire to his home in Countesthorpe, just south of Leicester. 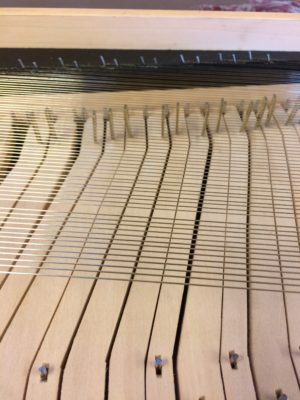 The piano is a small but dense Challen; we’re letting it acclimatise for a couple of weeks before tuning it. 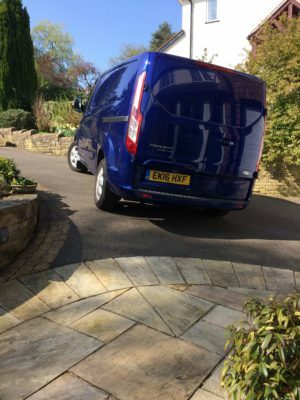 Despite the steepness of the drive at Prestbury and a gravel drive at Countesthorpe the move went well, aided by the loan of a piano trolley from Newark College. There is always something different to do at Broadwoods! 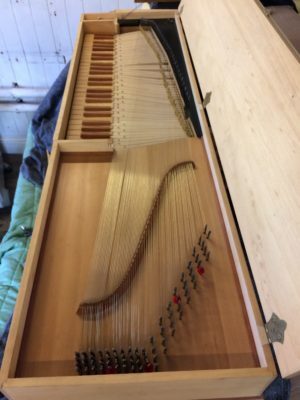 Last Monday we were cleaning and key easing a new build clavichord that had been in storage for a while. The plan is that the plain case will soon be getting decorative paintwork. 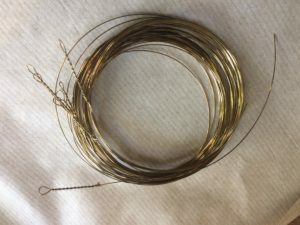 This week’s task was to make spare strings for it ranging in size from 0.27mm diameter to 0.60 diameter in approximately 0.03 increments – all from brass wire. 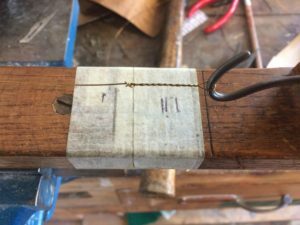 Winding the strings onto the tuning pins is a bit tricky – if the tension is let off the winding, the whole thing comes unravelled! Saturday 11th March saw a group of enthusiastic ringers gathered at Ratby. Not for ringing, but for this year’s Guild maintenance course; I enjoy these occasions so was delighted when Mark Pendery, the Guild president, asked me to run the course again. This year we had representatives from a wide area – Ratby, Wigston Magna, Leicester St Margarets, Long Whatton, Great Bowden, Markfield and Stathern. I started by giving a brief health and safety talk about what is essentially common sense, something that sounds obvious, but it’s amazing how often accidents are caused or made worse by not using common sense. The example of Robert Wood, who had a lucky escape when he lost his footing whilst doing routine maintenance and came off second best to a Hastings stay and had to be flown by the Yorkshire air ambulance to hospital in Middlesbrough (his case was used on a recent television show), was used to illustrate how things can go badly wrong. Duly chastened and with instructions to look for and point out to me any hazards, my charges ascended the tower to look at the bells. I’m pleased to say that a number of potential hazards were identified, fortunately none of them was major but something for the locals to address. The bells at Ratby hang in an unconventional frame; it comprises of a single grillage of steelwork with the pulleys and Hastings slider brackets being supported from the belfry floor. Perhaps because even with this arrangement the bells hang half way up the louvred windows is the reason the more conventional cast iron and steel frame was not installed by Taylors in 1896. 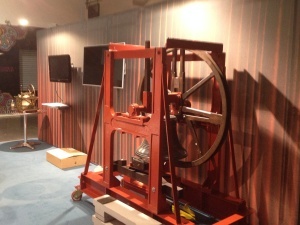 The frame was laid out for eight bells, although the two trebles were not installed until 1931. As you might expect, the engineering on the installation is very robust and apart from regular maintenance and painting it is just as it was left, even the plain bearings on the back six are still working well. The tower is significantly larger than the room required for the bells which was very useful in that it allowed plenty of room for us to walk around and look at the installation. 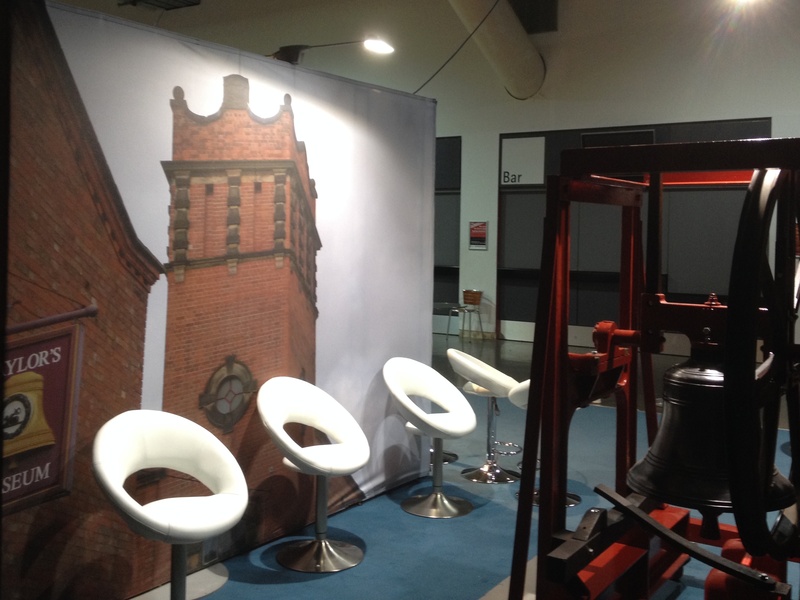 The bells are hung with very typical ringing fittings, cast iron headstocks, wooden wheels, clappers, pulleys, stays and sliders. We talked through the potential problems with all of these and what it was possible for the steeple keeper to repair and what needed more professional attention. After a welcome break for drinks and biscuits we concluded our discussions in the belfry by ringing one of the bells up and looking at the way that the slider arrangement works which elicited plenty of questions and answers. I invited everyone there to contact me if they wanted any further advice or a visit to their own bells which I’m pleased to say they have done. I’ve had some unusual phone calls about bells in my time, but the one I got recently was up there in the top ten. It was a call from the secretary of the Belgrave Hall Conservation Area Society who also has care of the redundant church of St Peter’s. He was puzzled one day when he went into the church to find that a number of the bell ropes had apparently broken themselves and were lying on the floor in a dishevelled heap. What happened was that a squirrel got in through the louvres but couldn’t work out how to get back out of them. The rope holes in the floor were a means of escape apart from a rope through each of them, so it chewed through two ropes at the belfry level and two at the clock chamber level, leaving the third rope with barely one strand holding it together and the sixth rope with a big chunk out of it. The squirrel was later spotted in the church and released. So total damage was six ropes needing to be re-spliced which I have now done and refitted so that the bells are serviceable for the next ringing. Excellent news for the Cheltenham project! They must have liked my submission. I am pleased to inform you that the consultation process we carried out resulted in no adverse comments. I suggest that the detailed faculty submission is now prepared. I look forward to receiving completed forms and supporting information in due course. We have now drawn up a budget based on the scheme we want to undertake. The next step is faculty and funding. We will shortly be presenting the scheme to the diocesan authorities so that it can be discussed and any queries sorted out before it is presented to the DAC. 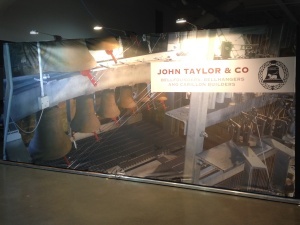 Some of the bells have already been promised and we intend to offer packages for the other bells, fittings and framework tailored to suit both individual donors and corporate sponsorship. The timescale for the project is dependent on the rate at which funds are raised, but we have booked a provisional slot in Whites schedules for the fourth quarter of 2105. Andrew’s former employer – John Taylor & Co. – employed Exaudite to design and deliver their stand to the roadshow using a company called Skyline Whitespace; they spent the Friday setting up the stand ready for Taylors to use on the Saturday. 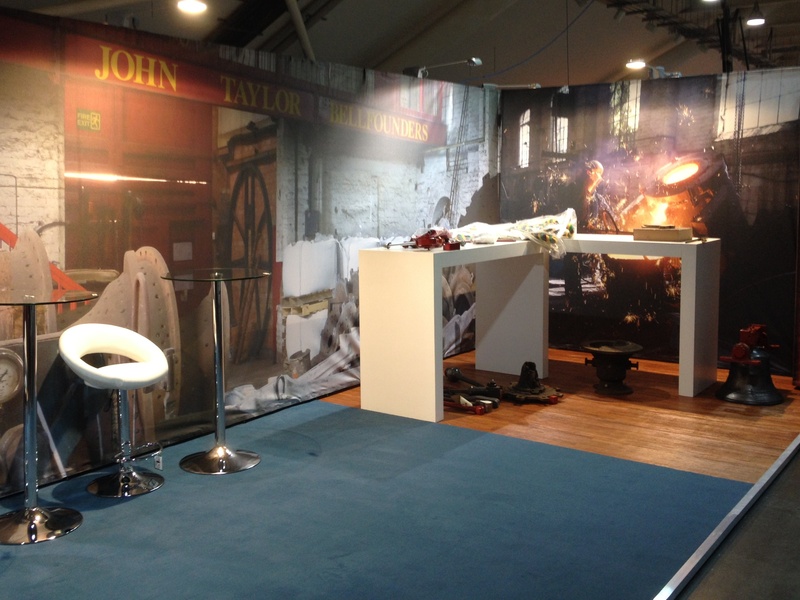 Taylors were very pleased with the professional appearance of the stand. 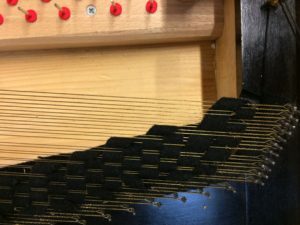 As well as the Taylor profile bell, Ben had cast a numbers of other small bells including one very thick carillon type treble bell sounding a high C. Although it was a sound casting, as is often the case, the bell had a split partial causing its tone to “wobble”. I was able to identify two nodes giving the two separate hum frequencies approximately 4 cents apart. Ben put a vertical cut along the line of the upper of the two notes, lowering its pitch to that of the lower, and eliminating the wobble. I am grateful to JJ Smith and Ben Sunderlin for their considerable hospitality whilst I was with then.